The global digital pathology market is expanding at a rapid pace, driven by increase in installation of digital pathology systems. The global market was valued at US$ 340 Mn in 2017 and is projected to reach more than US$ 900 Mn by 2026, expanding at a CAGR of more than 12% from 2018 to 2026. The global digital pathology market is witnessing expansion at a relatively higher growth rate owing to increase in technological advancements in image analysis software, rise in trend of automation in healthcare, and high prevalence of cancer. Digital pathology is defined as a dynamic and an image-based environment, which enables management, interpretation, and acquisition of pathology information from a slide to a computer screen. The pathologist observes the slide under a microscope and when the slide is digitalized with help of image analysis software, it can be shared over a distance for consulting, which is known as telepathology. This system is expected to streamline activities and workflow of diagnostic laboratories and pathologists during the forecast period. Digital pathology is considered as an emerging technology, which aids in improvisation of several applications such as diagnosis of the diseases, drug discovery, academics, and research. The global digital pathology market is projected to expand at a significant CAGR during the forecast period. Rise in number of installation of digital pathology systems, accuracy in pathological assessment, and high quality delivery of results are some factors that are expected to drive the market from 2018 to 2026. Furthermore, increase in prevalence of cancer, rise in workload of pathologists, and ever increasing clinical and preclinical trials are other important factors attributed to boost the global digital pathology market during the forecast period. However, the high cost of the systems, stringent regulatory requirements, and sampling error are some factors that are likely to restrain the global digital pathology market during the forecast period. The global digital pathology market can be segmented based on product type, end-user, application, and region. In terms of product type, the market can be classified into image analysis software and scanners. The image analysis software segment held a major share of the market, in terms of revenue, in 2017. Technological advancements and rise in trend of automation are some factors that are expected to augment the segment during the forecast period. Based on end-user, the global digital pathology market can be categorized into diagnostic laboratories, academic & research centers, pharmaceutical companies, and others. The diagnostic laboratories segment held a prominent share of the market, in terms of revenue, in 2017, followed by the academic & research segment. Increase in workload of pathologist and larger patient base are likely to propel the diagnostic laboratories segment during the forecast period. In terms of application, the global market can be segregated into diagnosis, consulting services, educational, and others. The diagnosis segment accounted for a major share of the market in 2017, in terms of revenue. Increase in prevalence of infectious diseases is an important factor driving the segment during the forecast period. North America held a significant share of the global digital pathology market, in terms of revenue, in 2017, followed by Europe. Rise in acceptance of the digital pathology system in the region and shortage of pathologists in North America are key factors boosting the market in region. Developed countries such the U.K. and Germany exhibit higher awareness about digital pathology and their applications. This is expected to boost the market in the regions. The market in Asia Pacific is expanding at a rapid pace. The countries such as China, India and Japan have an immense potential for the growth of market due to high prevalence cancer, rising population and improving healthcare infrastructure in the region. Key players in the global market are adopting strategies such as mergers and acquisitions, technological development, and geographic expansion in order to capture significant position. Major players operating in the global digital pathology market include Leica Biosystems Imaging, Inc, OLYMPUS CORPORATION, F. Hoffmann-La Roche Ltd, GE Healthcare, Mikroscan Technologies, Inc., Koninklijke Philips N.V., Sectra AB, and Inspirata. The research is a combination of primary and secondary research. Primary research formed the bulk of the research efforts along with information collected from telephonic interviews and interactions via e-mails. Secondary research involved study of company websites, annual reports, press releases, stock analysis presentations, and various international and national databases. The report provides market size in terms of US$ Mn for each segment for the period from 2018 to 2026, considering the macro and micro environmental factors. 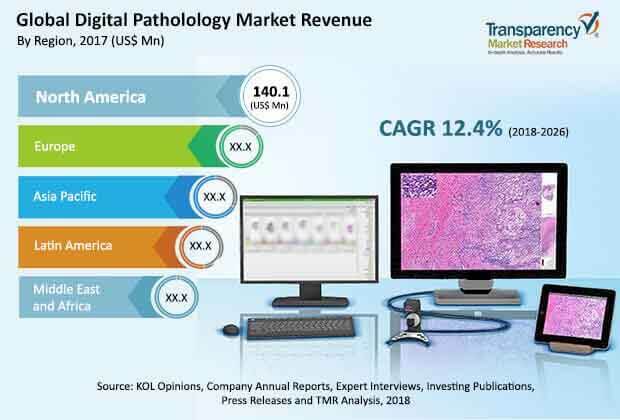 Growth rates for each segment in the global digital pathology market have been determined after a thorough analysis of past trends, demographics, future trends, technological developments, and regulatory requirements. A detailed qualitative analysis of factors responsible for driving and restraining the market and future opportunities has been provided in the market overview section. This section of the report also includes market attractiveness analysis that provides a thorough analysis of the overall competitive scenario in the global digital pathology market. Market revenue in terms of US$ Mn for the period between 2016 and 2026 along with the compound annual growth rate (CAGR %) from 2018 to 2026 are provided for all the segments, considering 2017 as the base year. Market size estimations involved in-depth study of features of different types of product types. Additionally, market-related factors such as rise in prevalence cancer, product launch, and historical year-on-year growth have been taken into consideration while estimating the market size. Digital pathology is defined as a dynamic and an image-based environment, which enables management, interpretation, and acquisition of pathology information from a slide to a computer screen. Demand for digital pathology is rising owing to the increase in prevalence of cancer and rising trends of automation in health care. Based on product type, the global digital pathology market has been classified into image analysis software and scanners. The image analysis software segment is expected to expand at a significant CAGR during the forecast period. In terms of end-user, the global digital pathology market has been segregated into diagnostic laboratories, academic & research centers, pharmaceutical companies, and others. The diagnostic laboratories segment is anticipated to dominate the market from 2018 to 2026. Based on application, the global digital pathology market has been segmented into diagnosis, consulting services, educational, and others. The diagnosis segment held a prominent share of the global market, in terms of revenue, in 2017. In terms of geography, the global digital pathology market has been segmented into five major regions: North America, Europe, Asia Pacific, Latin America, and Middle East & Africa. The regions have been divided into major countries. The report also profiles major players in the global digital pathology market based on various attributes such as company overview, financial overview, SWOT analysis, key business strategies, product portfolio, and recent developments. Key companies profiled in the report include Leica Biosystems Imaging, Inc, OLYMPUS CORPORATION, F. Hoffmann-La Roche Ltd, GE Healthcare, Mikroscan Technologies, Inc., Koninklijke Philips N.V., Sectra AB, and Inspirata.